The Neuf Memorial Run, a 9K and two-mile run, will hold its second annual event at Bethel College (North Newton, Kan.) on Saturday, Jan. 12, to honor the memory of Russ Neufeld, a Hesston alumnus, director of Hesston’s Information Technology department and transplanted Canadian who lived his last 15 years in central Kansas. Neufeld passed away on Jan. 21, 2017 after an 18 month fight with non-hodgkin’s lymphoma. The event raises money for the Russ Neufeld Memorial Scholarship at Hesston College and the Leukemia and Lymphoma Society. The race will start at 10 a.m. outside of Mojo’s Coffee Shop (300 E. 27th St.) on the Bethel College campus. The Neuf early entry fee ends at midnight on Dec. 9 and is $40 for the 9K and $30 for the two-mile. The entry fee increases to $45/$35 on Dec. 10, and online registration closes on midnight on Jan. 9. On-site registration will be available on race day for $50/$40. The 9K distance is as unique as Neufeld. Neuf, which means nine in French, was a nickname for Neufeld, and his stick shift handle on his car was a 9-ball. The inaugural Neuf 2018 had more than 200 runners run the races in North Newton along with satellite runners running in 18 locations in the United States as well as in Australia, Colombia and Canada. The Neuf donated $7,000 in race proceeds to its charity recipients, and generous donations brought in additional funds. Race organizers hope to exceed those numbers this year. All registered runners receive a timing bib, a Neufbeuf (a neck warmer), a Neuf sticker and post-race festivities at Mojo’s which include coffee, hot chocolate, and continental and hot breakfast items. Medals will be awarded to age group winners, and the top three male and female finishers receive handmade pottery wall artwork from Hanna Eastin Pottery. Race day registration closes 15 minutes before the race and may not include a Neufbeuf. 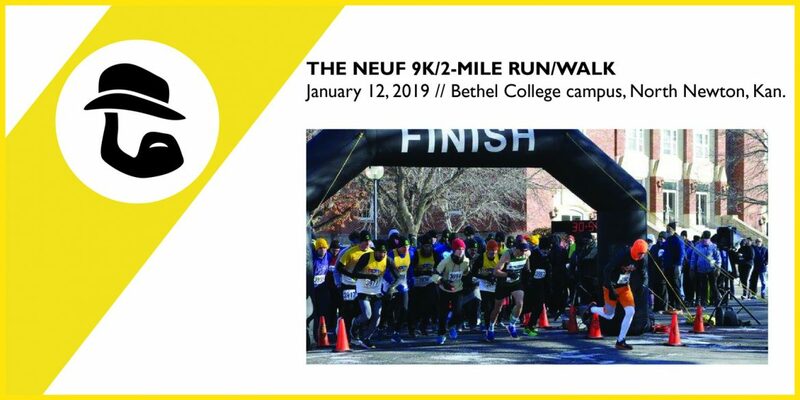 Visit The Neuf online for more information and to register for the run.